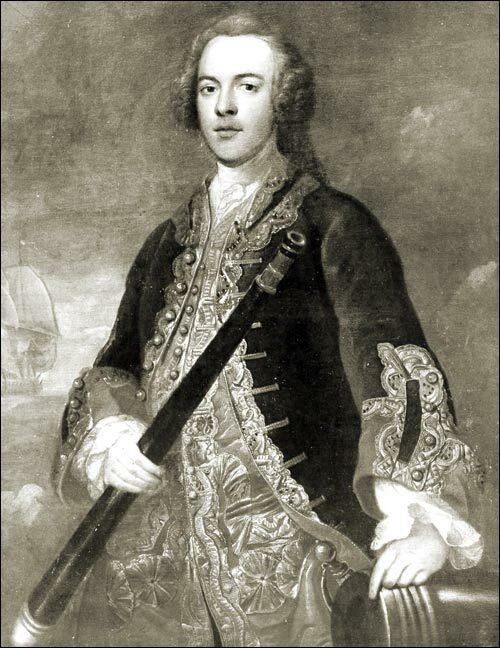 John Campbell was born in Kirkcudbrightshire, Scotland in or before 1720. He went to sea as an apprentice at a young age, and joined the Royal Navy. He sailed around the world in 1740 on the Centurion as midshipman and became lieutenant around 1745. He became a captain in 1778, and vice-admiral in 1779. Campbell served as Governor and Commander-in-Chief in Newfoundland from 1782-1786. During his term, Campbell proclaimed religious freedom for all inhabitants of Newfoundland, including Roman Catholics. He stated: "Pursuant to the King's instructions to me you are to allow all persons inhabiting this island to have full liberty of conscience and the free exercise of all such modes of religious worship as are not prohibited by law..." As a result, James Louis O'Donel, the Roman Catholic bishop, authorized the construction of a chapel and celebrated mass. During his term, Campbell was involved in the legislation of the Island. One matter of concern was the inhabitants that claimed land used by the public for the fishery. He held an inquiry and a public wharf and storehouses were established as a result. After his term, John Campbell returned to London where he died four years later on December 16, 1790.